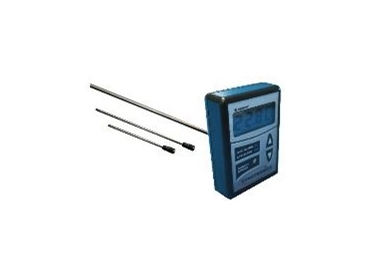 THE highly accurate SynoProbe temperature probes from Synotronics allow the user to track temperatures throughout a facility easily using the unique internal serial number. This can increase the amount of information recorded whilst reducing the cost of measuring temperatures throughout a facility. By connecting the SynoProbe to the SynoLog temperature logger, a user can view and record the temperature at that point in time, and the serial number will be recorded as well. Then connecting the SynoLog to the computer the user can download this information and have accurate data records of the temperatures which can be viewed in Excel or the free SynoLog Studio software. In the Synolog Studio software the user can easily change the name of each probe for easy identification on every download. In a case study of a facility using standard temperature probes in tanks they needed to have expensive probe readouts in each tank and a staff member writes down each reading. With the SynoLog, the user can position a less costly SynoProbe temperature probe in each tank instead and the staff member can carry one SynoLog to get a reading on the display and a saved record of the temperature. This dramatically reduces the cost of a whole system. The SynoProbes come in various lengths with or without cable leads. Custom probes can be made to suit any application.